Verónica Michelle Bachelet Jeria AC (Spanish pronunciation: [beˈɾonika miˈʃel baʃeˈle ˈxeɾja]; born 29 September 1951) is a Chilean politician. She served as the President of Chile from 11 March 2014 to 11 March 2018. 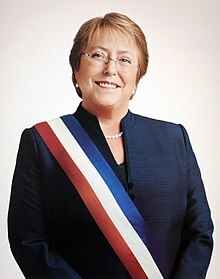 She was also President of Chile from 11 March 2006 to 11 March 2010. She was the first woman president of Chile. In 2010, Bachelet became the president of UN Women. In 2013, she resigned from that position. This page was last changed on 12 August 2018, at 19:28.